When it comes to Arizona auto maintenance, engines seemed to get all of the attention, while transmissions are often neglected. Although the engine may be the most expensive part of your vehicle, transmission repair in Tempe comes in as the next most costly. In light of that, it’s surprising that transmissions have been found to be the most neglected part of auto maintenance. Let’s take a look at some false beliefs you may be harboring about your transmission. The earliest automatic transmissions became more readily available to the public in the early 1940s. The first manufacturer to offer to offer this option was Oldsmobile, and they were known as Hydra-matic, because it used hydraulically controlled planetary gear sets. Today, automatic transmissions are by far the more popular choice among Arizona drivers. Less than 7% of cars sold in the past year have manual transmissions. Car owners don’t want to be bothered with the task of working a clutch with their foot while shifting gears with their hand, although some Arizona drivers would disagree. They consider shifting a manual transmission to be more engaging and fun. In addition, it requires more skill and makes for a better driver. One of the most common causes of car accidents today is distracted driving. A manual transmission makes for a more attentive driver, since you can’t eat, drink, or use your phone while shifting gears. Many sports car drivers, especially those interested in racing still like a manual transmission, but that may change, since the newest, computer controlled cars can shift more quickly than any driver is able to. As computerized engine control units became standard, much of the logic built into the transmission’s valve body was off loaded to the engine control unit. Many manufacturers use a separate computer dedicated solely to the transmission, called a transmission control unit. As the transmission control unit shares information with other computers it enables more precise control of shift points. While the automatic transmission was one of the greatest advances in the history of the automobile, there are more significant changes coming in the form of electronically controlled transmissions. That used to be the case, but this is no longer a given. Today, some makes or models may cost slightly less with a manual transmission, but you may very well pay the same price for a particular vehicle whether it has a manual or an automatic transmission. Once again, while that used to be true, many of today’s, automatic transmissions have seen numerous technological advancements including the addition of more gears. These innovative, computerized automatic transmissions are now able to compete with manual transmissions when it comes to gas mileage. Ford actually offers two different models that have automatic transmissions boasting slightly better gas mileage than the same model equipped with a manual transmission. An important element of your auto maintenance program is having your transmission serviced by a Tempe auto mechanic according to the recommendations in your owner’s manual. Instead, many automotive mechanics try to sell a transmission flush service which is often unnecessary. Any unskilled technician can remove the lines while the engine is running and add more fluid while fluid is draining out, leaving out any inspections and neglecting to change the filter. Beware! A transmission service should begin with a test drive and proceed with an inspection. This is when minor problems can be found before they turn into major problems. Then the filter and pan should be removed, the fluid drained, and a new filter installed before the fluid is replaced. Transmission fluid moves through the filter, so the filter can catch any debris. A filter can eventually become plugged up with debris which can hamper the flow of transmission fluid, preventing the transmission from being properly lubricated. A mechanic experienced in transmission repair will understand the difference between modern transmissions and older transmission. One difference is that today’s automobile manufacturers produce transmission fluids specific to the needs of specific transmission designs. A less reputable car repair shop may use universal transmission fluid they purchased in bulk. You should always insist on the 0EM recommended transmission fluid. At Scottsdale Muffler & Automotive we understand that a transmission creates higher temperatures than an engine, and that heat is the worst enemy of moving part. We know that a little service now is much less costly than extensive transmission repair later. We offer over two decades of experience, ensuring that your vehicle is always in competent hands. We are a local, family owned business that takes pride in our high quality work and excellent reputation. If it’s time to have your transmission serviced, there is no better place to take it. We will help you get the most miles possible out of your car’s transmission, using state of the art diagnostic equipment. If any repairs are needed, they will be done correctly and you will be pleasantly surprised at how fair our prices are. 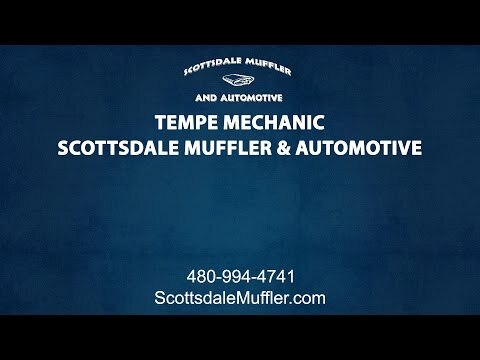 We want your repeat business and appreciate it when you refer family and friends to us here at Scottsdale Muffler & Automotive.